To honor Lakers great Kobe Bryant on his final National Basketball Association (NBA) game after a stellar 20-year career with the team, the Los Angeles County Metropolitan Transportation Authority (Metro) will rename the Metro Blue/Expo Pico Station the Kobe Station for one day this Wednesday, April 13. 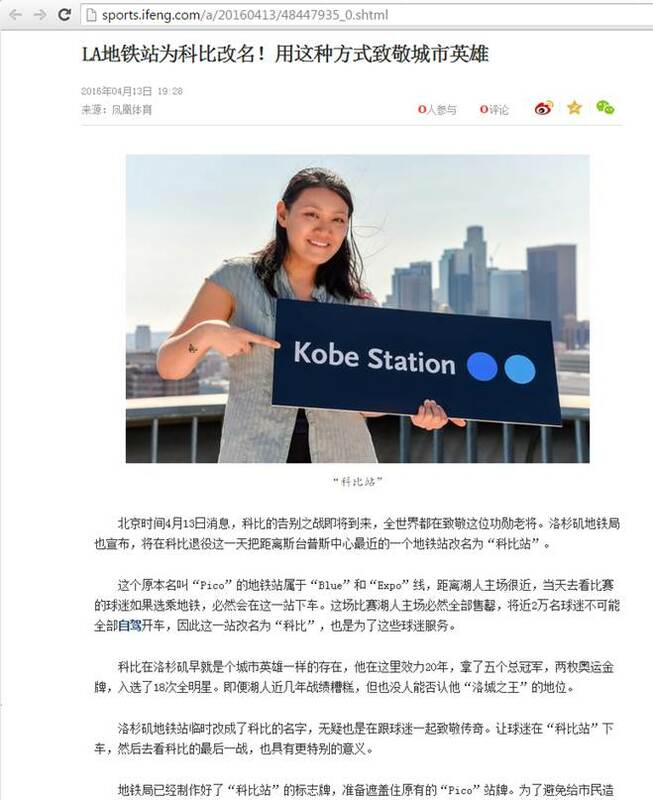 The Kobe (Pico) station is situated two short blocks from Staples Center, the home of the Lakers, and is the transit embarkation point of choice for Lakers fans. Bryant’s final game in a Lakers uniform is expected to fill the 19,064 seat Staples Center and fans will avoid traffic by taking the Metro Blue and Expo lines to the game. Since being drafted out of high school in 1996, Bryant has led the Lakers to 5 NBA championships, was named to 18 All Star teams, was a 15-time all NBA team, an NBA All-Defensive Team designee 12 times and a 2-time Olympic Gold Medal winner (2008 and 2012). The Kobe station services the Metro Blue Line, which averages nearly 2 million boardings per month, and the Metro Expo Line that averages nearly 800,000 boardings monthly. Boardings on the Expo line are expected to grow exponentially after May 20, 2016 when the line expands by 6.6 miles to 7 additional stations, ending at 4th Street and Colorado Avenue in downtown Santa Monica. UPDATE, Wednesday 10:15 a.m.: media interest in the ‘Kobe Station’ has been substantial. See below. I think having LA’s transit ridership double every year would be a great problem to have. Unfortunately, I’m not sure that was the word you were looking for. Maybe dramatically would be less of a hyperbole? So will it be Pico/Chick Hearn/Kobe Bryant? I wonder if some day, Metro will come to regret doing this. No. No one cares about that personal matter. Hopefully one day people will care. It’s worth caring about, and there’s plenty of people who are starting to care very much. That’s going to confuse some Japanese tourists. This is more current, but was Pico Blvd. named after Pio de Jesus Pico, the first African/Mexican Governor of California? If, so knowing this could have a unifying effect in the city. We support Kobe too. So what can I cay.